Jessica Sporn Designs: One Little Word: Fierce! Posting to you from Israel, with the word up at One Little Word today, which is FIERCE! I like being described as fierce! Certainly, I am fierce in my beliefs, fierce in my instinct to protect those I love, and fierce my passion to live life creatively and to the fullest. "Heaven has no rage like love to hatred turned, Nor hell a fury like a woman scorned." Act 3, Scene 2, The Mourning Bride (1697). Fierce is passionate. Being fierce means you care. What are you fierce about? This is a page in my art journal. I drew the face and doodled the flowers with a Pitt Pen, then colored them with Neocolor II crayons and a water brush. Around the edges, I stenciled borders from my Border Stencil from Stencil Girl with white gesso and acrylic paint. I added the text digitally. 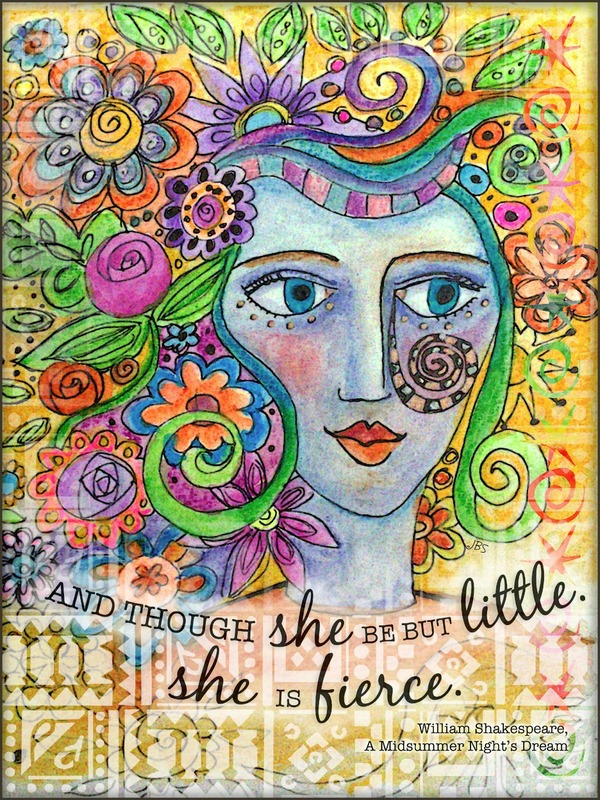 I hope you are inspired to create something around the word "FIERCE," and link it up to One Little Word! Need more inspiration? Check out all of the work by the amazing Design Team! Linking to all my favorite Monday blog hops: Make It Monday, Mandarin Orange Monday, Creative Every Day, Inspire Me Monday, and Be Inspired. Beautiful page and I love the word choice. Fierce, what a beautiful word. In dutch the translation gets somewhat lost, I think. For the reference to strength disappears and only the fury remains. Me, I am tiny but fierce when it comes to my loved ones and things I am passionate about. Though I have mellowed a bit over the years. Which is a good thing I suppose, I choose my battles now and no longer let them pick me. Love, love, love this page. Jessica, your work is beautiful. I am fierce about protecting those I love. I was a fierce teacher working tirelessly to see that all of the children got what they needed and deserved. Now, I am fierce when I coach others. Thank you for the question. I would not have described myself as fierce but now I can see where it would apply. The colours are so yummy, and the swirls and flowers playful! I've never thought of fierce as a positive word. When I think of fierce, I think of people who are not sensitive to how their actions will effect others and go in for the kill. So you have an interesting take of the word. In terms of your definition, I am fierce about my family, doing the right thing, the environment and art! Thanks for causing me to think! A woman who knows who she is! Love the portrait-especially all the flowers that balance out the usual thoughts of fierce! I am fierce about appreciating the interconnectedness of this beautiful world we live in! That means making wise choices in my thoughts and actions! 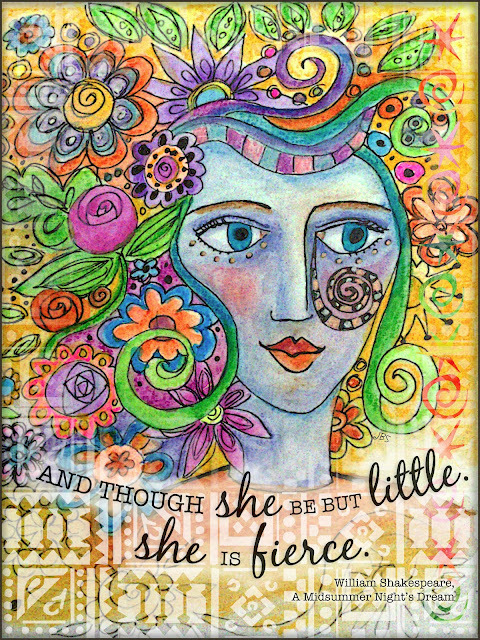 Your art journal page is fierce! Love the face, gorgeous hair and color! This is brilliant! Thank you so much for sharing it with us at MIM! Good luck! I'm curious if you are creating art in Israel, or if you posted ahead?! She has an ethnic look about her! I ate falafel this weekend, but it wasn't as good as what I got in the Afula bus station! Oh your travels are bringing up so many memories for me! Ill have to give some thought to the question of fierceness! lovely story, and the art is magnificent. I like how you did the borders, and all those colourful flowers in her hair. Great work! Thanks Patsy! I'm so excited to wi your giveaway and am sending you my snail mail address! 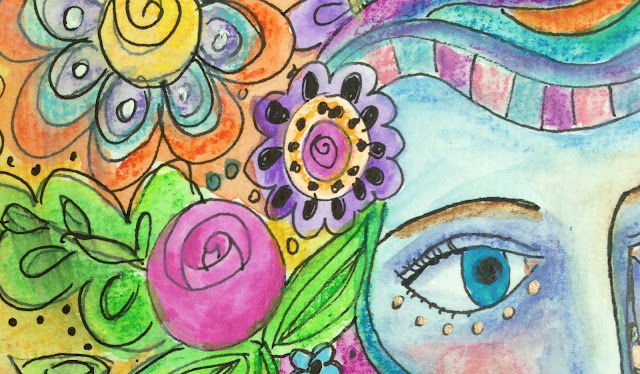 I love your art journal page, it is gorgeous! Thank you for posting such an inspirational post. New follower via MIM. Came from MIM to see more. Gorgeous creation that really inspires. Fierce is such a great word and emotion. I should probably try and be it more. How beautiful!! Love the amazing hair on your fierce warrior woman. Gorgeous!